We have some exciting news to share about MTKO’s namesake – Matt Talbot. It is a good time to brush up on the history of our namesake (see quiz). Due to the occurrence of a possible miracle, the wheels are in motion to move Matt Talbot further along the road to sainthood. A recent article in The Leaven describes the incredible story of Talbot Watkins, a child in Kansas that doctors were certain would be born with severe health complications. In the days before baby Talbot’s birth, the Watkins family and their community prayed for Talbot’s health through the intercession of Matt Talbot. Due to a possible miracle, Talbot was born without complications and is a healthy one year old today. Read the whole story by going to http://www.theleaven.com/v36/v36n7talbot.html. The road to sainthood is lengthy and detailed. Reported miracles are assessed and documented to verify that healing occurred without any scientific explanation. If one miracle is verified, the candidate can be beatified (and then called “Blessed”). If two miracles are verified, the candidate can be canonized (and called Saint). We know that God is at work at Matt Talbot Kitchen & Outreach. We definitely believe in miracles. And we are inspired by Matt Talbot’s life. 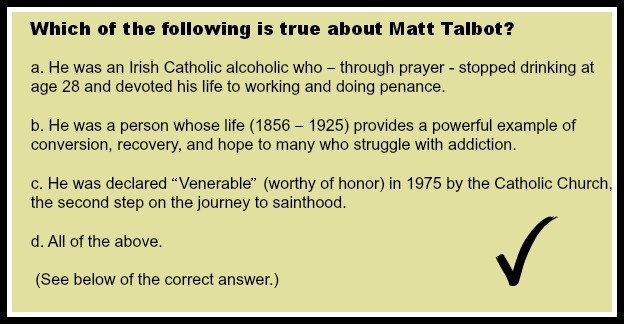 Stay tuned for further developments on Matt Talbot’s road to sainthood. And, by the way, Baby Talbot’s name was inspired when his parents were in Lincoln and drove past Matt Talbot Kitchen & Outreach! p.s. The correct answer to the quiz was “D”!